Congratulations, Dr. and Mr. Davenport! Driving to Camarillo from Burbank isn’t too fun, but Charlie and Crystal’s wedding was a blast! Thank you so much, guys, for inviting me to be your wedding officiant! There were three things that made your wedding so much for for me. First was the camaraderie I felt with Richard, Luis and Ryan after sharing table space with them at the rehearsal dinner. We had some great conversation and laughs, and Ryan’s hovercraft story was just the material I needed to add an extra personal touch to your ceremony. Secondly, Charlie, your mom is a great character and amazing woman. 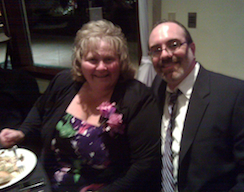 I had the pleasure of sitting with her throughout the reception, and we had an amazing time. I don’t know how typical a Rhode Islander Debbie is, but I sure want to visit her and your homestate soon, especially once she gets her local artisan gallery open. I was also very taken by the Sterling Hills Golf Club! 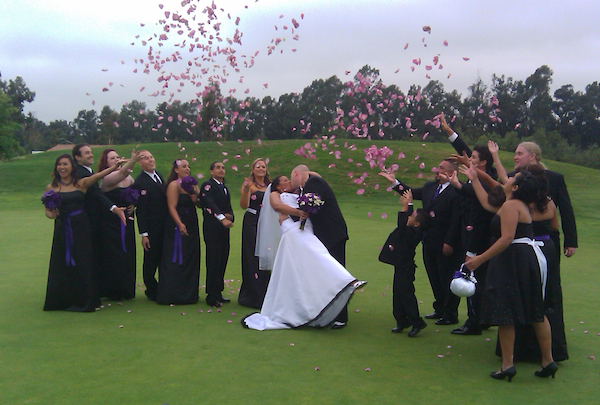 Not being a golfer myself, I wasn’t sure how a wedding at a golf club would feel, but the fairways and greens made a great backdrop, and the putting green was a cool spot for the post-ceremony photos. The Spanish-style clubhouse itself was also beautiful, decked out in black, purple and white. And the food…YUMMM! Again, congratulations, Crystal and Charlie. It was an honor and a pleasure to be your wedding officiant. Ahead this week are three meetings with potential couples! 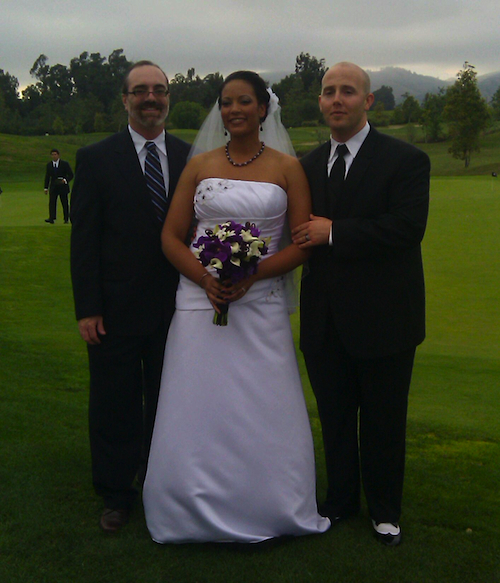 AND Julie and Mark’s wedding is this Friday in Santa Monica, so I’ll be posting a new wedding entry soon! 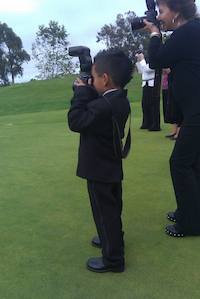 This entry was posted in wedding officiant and tagged golf wedding, Los Angeles, Sterling Hills, wedding officiant. Bookmark the permalink.